Buying organic stuff is always nice because I believe that there are no impurities in it and that most of the products are handmade and as close to the nature as possible. I chanced upon the Omved Store in Inorbit Mall. One thing I must say is that their online website is a tad confusing as I could not locate the product list that I could buy from. All this set my wallet back by approximately INR 2500. My review on these products. 1. Sudyuti Kerathailam : Post pregnancy I was swamped by freckles and pigmentation. Nothing seemed to be helping me get rid of these. This skin oil came with the ptomise of giving a healthy complexion. Directions for use: 5 – 10 ml. massage on body and leave on as long as desired before a bath. Most effective if warmed prior ti use in a copper vessel OR use as directed by your physician. Since I don’t have a copper vessel, I heat it in a small bowl for roughly 10 seconds in a microwave. I have been using this product for about a month now and I have noticed a visible difference in my complexion. My freckles and pigmentation has reduced marginally. I guess with regular use, the results will be better. Once a week I leave the oil overnight and wash my face with warm water the next day. I use a gentle scrub to get the oil out of my skin. A foaming cleanser did not work for me. Directions for use: 5 – 10 ml. massage warm oil on affected area. Sweat the area with an ayurvedic compress. Can be repeated daily OR use as directed by your physician. 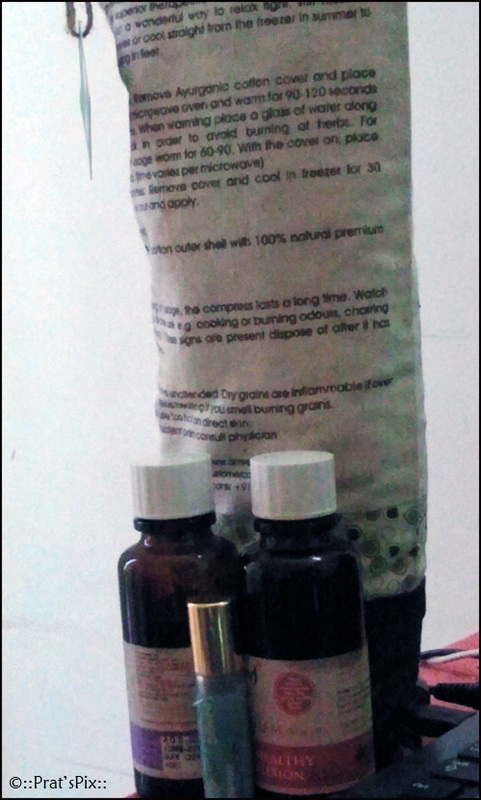 Both 1 and 2 are priced at INR 490 ( 125 ml). The only drawback is that they are in glass bottles and they are bound to break if they are dropped on the floor. I am not sure if it is the medicinal value that makes them store it in glass bottles, but I felt that it could have been stored in plastic bottles. These come in two sizes, 65 ml and 125 ml. I bought this for my kids who are regularly prone to a cough and cold with the changing weather. And whenever I have applied this roll-on to them, I have noticed an ease of breathing till the effect wears off. You roll it on the nose, above the upper lip and the chest. I used it at least twice a day. This doubles up as a hot and a cold pack. 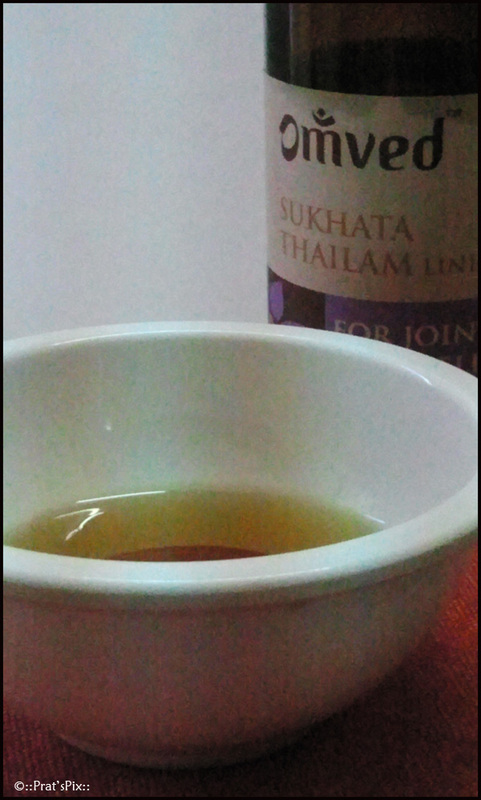 I used this after I had applied the Sukhata Thailam on my aching feet. You need to warm the compress in a microwave with a cup of water for about 2 minutes. Glide your foot in the compress and relax. Thank you for the review!! You made our day!! We pack all our oils, creams, lotions in either glass or aluminium cans, not only to protect the formulations (no bpa leaking into them, no light penetrations and no erosion by the essential oils) but also because our products need to be SAFE for you and the earth! no plastics (although much much cheaper) for us. you could recycle all our containers at our stores and receive our bath-bars in exchange!! 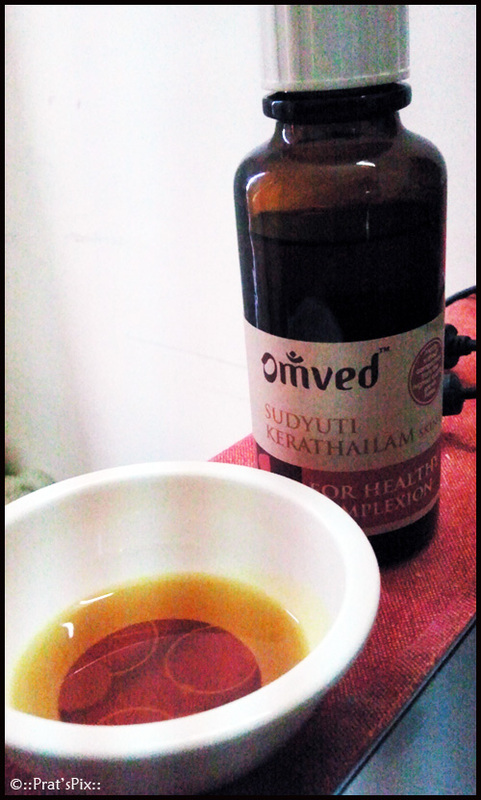 Sudyuti Kerathailam – Ideal to wash off with an ubtan (cleansing grains and herbs) instead of a foaming cleanser. It is preferable not to leave on at night if you have an oily skin. Sushwasa Remedy Roller – rolled on the chest and the back also helps to ease breathing. On the temples, it eases nerves. Can be used more often if required. Do contact us for further assistance or information. Once again. Thank you for the review!! Thanks for th info, I should have guessed about the plastic bit 🙂 Thanks for giving me the info on how to wash the Sudyuti Kerathailam. I have a combination skin and when I keep it overnight, my skin tends to soak the oil. Do you still recommend not to keep it overnight? Always welcome. :) Well if your skin feels good and normal the day after, then i think it is okay to leave it on at night.